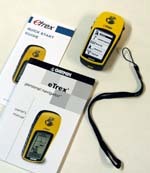 The Garmin eTrex is a basic receiver, being the bottom of the eTrex line. The eTrex line also includes the Camo, Summit, Venture, Vista Vista C, Legend and Legend C. All 8 eTrex units are in similar cases but vary in color. The eTrex is small and it has only five buttons on the sides of the unit for easy operation and unobstructed view of the screen. 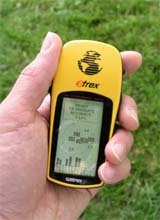 The Garmin eTrex GPS receiver, lanyard, owner’s manual, quick-start guide. Batteries not included. The Satellite Page shows all the information the unit needs in order to work. In the “Normal Skyview” mode it displays (in animation) the satellites, satellite signal strength, and the estimated location accuracy. The “Advanced Skyview” mode displays the satellites the eTrex is locked onto, each satellite’s assigned number, their approximate position in the sky, and their individual signal strengths. The Map Page shows where you are, where you’ve been, displays waypoint names and symbols, and shows where you’re going. The map can be oriented northward or you can choose to have it rotate so that your direction of travel is always at the top of the screen. The scale can be adjusted anywhere from 200 feet to 800 miles. The Navigation Page uses a compass (the compass only works when you’re moving) to show your moving direction and speed. If you’re moving toward a specific destination, it shows the name of the location, the distance and time to go, and displays a direction arrow in the compass ring. With the simple press of one button, you can display additional information such as maximum speed, position coordinates, elevation, trip timer, trip odometer, time of sunrise and sunset, and bearing. The eTrex is quite small, but not as small as the Garmin Gekos. It has a band of rubber around the sides, top and bottom, giving a good grip and feel. The rubber-covered battery compartment door helps to resist sliding around on the dashboard or console when used in a vehicle. A bayonet-type latch makes access to the batteries easy. The manual says it will take up to five minutes to find the satellites when you use it for the first time. My test unit took 63 seconds out of the box. During a 1.5 mile “neighborhood test walk,” the eTrex had an estimated location accuracy of as little as 19 feet. Marking waypoints and naming them for selected locations was simple. The “Goto” feature is fundamental to a GPS receiver. After reaching the most distant point of my walk, and enabling “Goto,” the screen displayed the direction I needed to go to reach my starting point. As I followed the indicated direction, the time to arrival and distance is also displayed. The distance is shown in miles down to one-tenth of a mile, then switches to feet (if units has been set to statute). Upon arriving at my starting point, the distance remaining was within ten feet of being accurate. Testing the eTrex under moderate foliage cover and next to 60-foot sheer cliffs showed that it was noticeably affected by these conditions, but it still held on to enough satellites for proper navigation. Capable of only one route. The manual walks you through a “Goto” exercise – a good way to learn its use. I think it’s appropriate to compare the eTrex to the Geko 201 because they’re bothbasic receivers in roughly the same price range. Since the eTrex has been available longer than the Gekos the price of the eTrex has come down. The advantages of the eTrex over the Geko 201 are: 1) less expensive; 2) larger display; 3) longer battery life; 4) some users may find the buttons are easier to use.